Turns a paddle board into a hot sculling boat in less than 5 minutes! Fits most all SUPs! Fits most all SUPs! It will strap to any paddleboard over 10'. 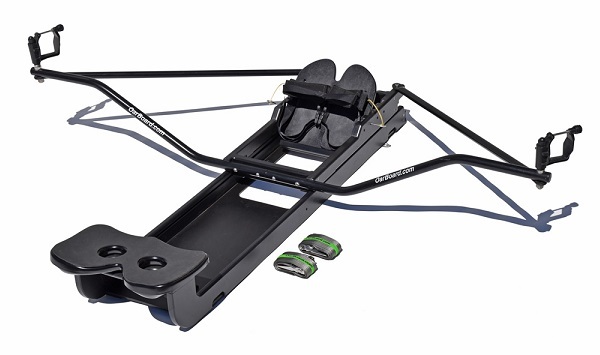 The sliding rigger system keeps the rower’s weight centered on the fixed seat so there is no pitching or hobbyhorsing! Comes complete with no major assembly required. Designed for use in salt or fresh water! Adjustable footstop for short to tallest rowers! Ideal for beginner or experienced rowers, club training programs or family fun, exercise and fitness training. Here at Megrew´s Boats we stock a large supply of oar board rowers and parts for the rowing community.